Nov. 10, 2016 (LifeSiteNews) - It's a remarkable photo. A woman in tears, her face contorted with anguish, apparently being comforted by a man - perhaps her boyfriend or husband? - who himself appears to be on the verge of breaking down, both their gazes set apprehensively at something happening above them, in the distance. The caption explains what's going on: "Shock was the dominant reaction, rather than anger at what was meant to be Hillary Clinton’s presidential victory party." The pair were photographed at Clinton campaign headquarters on election night, and are presumably staring at the TV screens on which are unfolding one of the greatest political upsets in history. But as poignant as that caption may be, it only tells half the story. The man is her husband, John Neffinger. And there, captured in remarkable vividness, is the mood of the pro-abortion movement in the wake of Trump's victory. Everything that extremist groups like NARAL and Planned Parenthood took for granted - Clinton's ascendency, the full weight of the United State's executive branch actively promoting the most extreme version of their inhuman ideology, more taxpayer funding than they would know what to do with, a Supreme Court permanently closed to the possibility of reevaluating Roe v. Wade and wholly inimical to any restriction on abortion no matter how mundane or commonsensical, the continued use of the Department of State to impose abortion, population control, and anti-family ideology on unwilling third-world nations, and on and on - all of this crumbling before their very eyes. As Trump's election became more and more assured, Hogue told Elle Magazine that she was scrambling to catch up, admitting that she had not even read the e-mail that her staff had drafted earlier in the day in case of a Trump victory. As recently as that afternoon, a Trump victory had been literally unthinkable. "We no longer get to live under the illusion that we're going to elect people who reflect our best interest," she bemoaned. "We're going to have to take control of our own destiny and take care of each other in ways we haven't had to do for a long time. But we've done it before and we'll do it again." One does not like even to appear to gloat in the face of another's very real sorrow. But the anger and the sorrow of Hogue and Richards are anger and sorrow at the loss of things evil and inhuman, and point to the possibility of better days ahead. Gloat, we must not, but we may indeed cautiously take heart that, for lack of a better way of putting it, the "right" people are as upset as they are. Trump, however, remains the wildcard that he has always been. While he has pledged to be pro-life, and made some specific promises to validate his commitment, the pro-life cause received distressingly scant personal attention from him during the campaign. It is now up to us to ensure that Hogue's despair is well-merited, and that Trump takes the promised steps to defend the most defenseless among us - to ensure that the power of government is employed in its most important task: protecting the right to life of all the country's citizens. 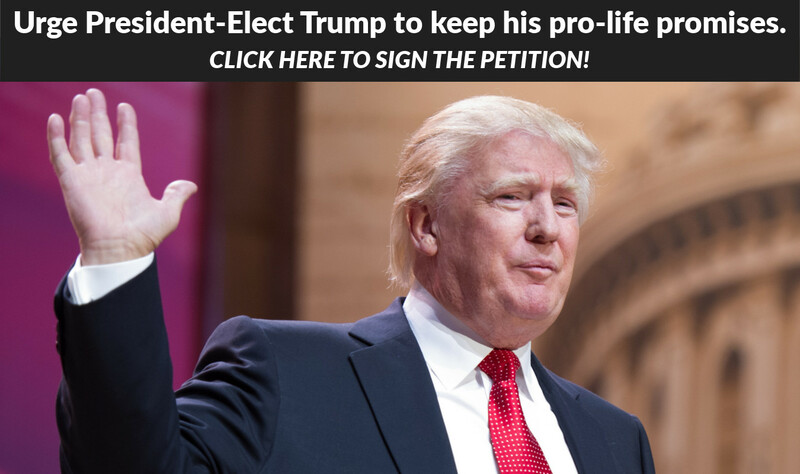 Take a moment to sign the petition to President-Elect Trump, urging him to follow through on his pro-life promises without delay. Click here.